Exploring in a canyon of old TV sets and computers destined for recycling at the Ceylon Waste Management Plant in Horona. 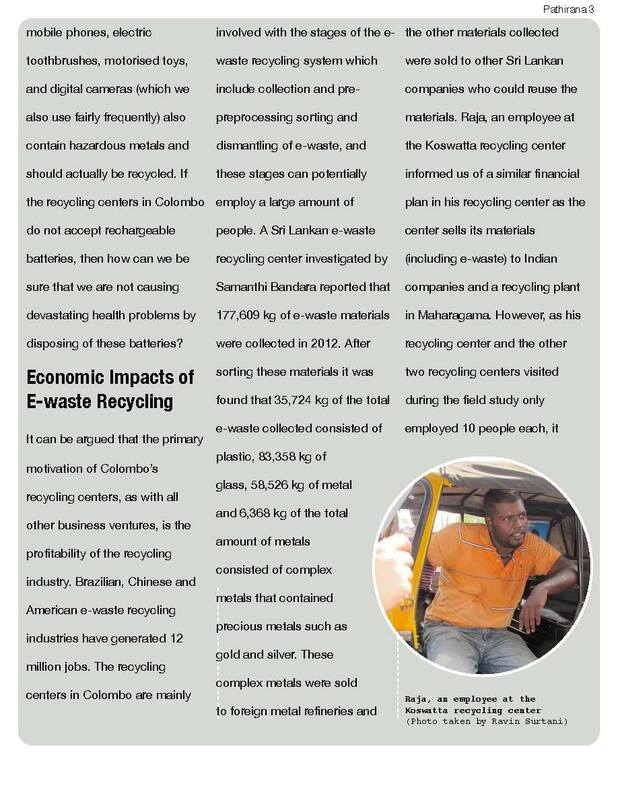 In order to avoid such issues of growing e-waste in dumps (such as the Meethotamulla garbage dump) and the aid in the possible future of recovering resources such as gold, copper and other valuable materials, Sri Lanka has investments in many e-waste recycling plants. 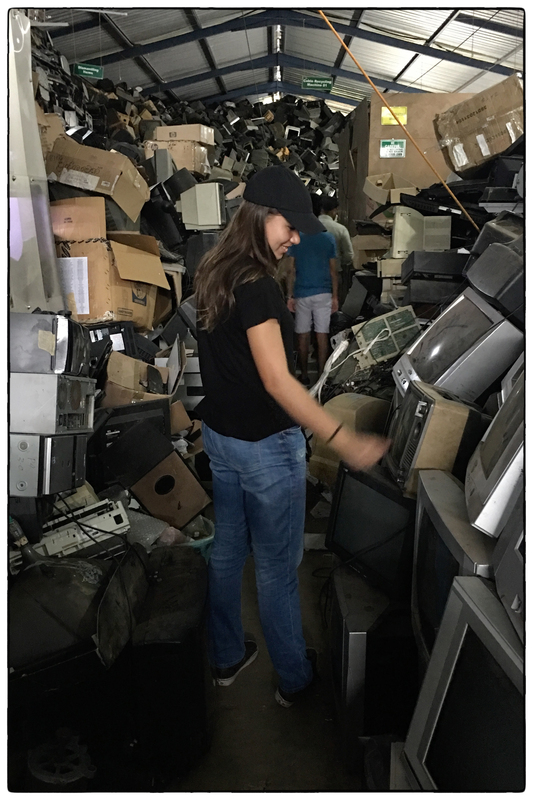 On the 12th of March 2018, the DP1 Geography students at the Overseas School of Colombo visited an e-waste management plant owned by Ceylon Waste Management. This is one of Sri Lanka’s largest e-waste factories and is aided in funding by Singer electronics. This factory receives approximately 1000 electronic pieces a day from local suppliers and exports most of its recycled materials to Europe (including the Netherlands and other European contries). In this plant, waste is treated in multiple ways. Some electronics are tested for reuse or resale. However, majority of electronics are too old to have value. Therefore, most items are salvaged for plastics, cathode tubes, copper, gold and other valuable metals. This recycling plant is one of the first steps in a more sustainable Sri Lanka, helping reclaim valuable items while preventing environmental pollution and wasted resources. REDUCE: Try not to buy unnecessary electronics. Instead of buying a DVD player, use the one on a computer you may already have. REUSE: If you have any e-waste that still works, resell it or give it for reuse. Ceylon Waste Management Co. Interview. 12 Mar. 2018. “Electronic Waste.” Wikipedia, the free encyclopedia, Wikimedia Foundation, 12 Mar. 2018. Web. Accessed 21 Mar. 2018. Hettiarachchi, Kumudini. 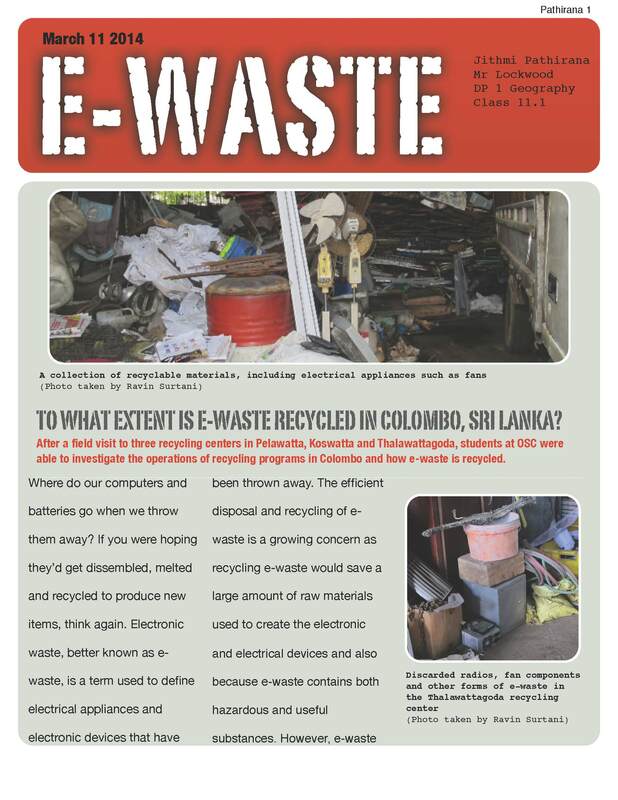 “Experts warn of e-waste being dumped together with garbage.” The Sunday Times Sri Lanka, 7 May 2017. Web. Accessed 21 Mar. 2018. Leblanc, Rick. “E-Waste Recycling Facts and Figures.” The Balance, 15 Mar. 2018. Web. Accessed 21 Mar. 2018. Warakaptiya, Kasun. 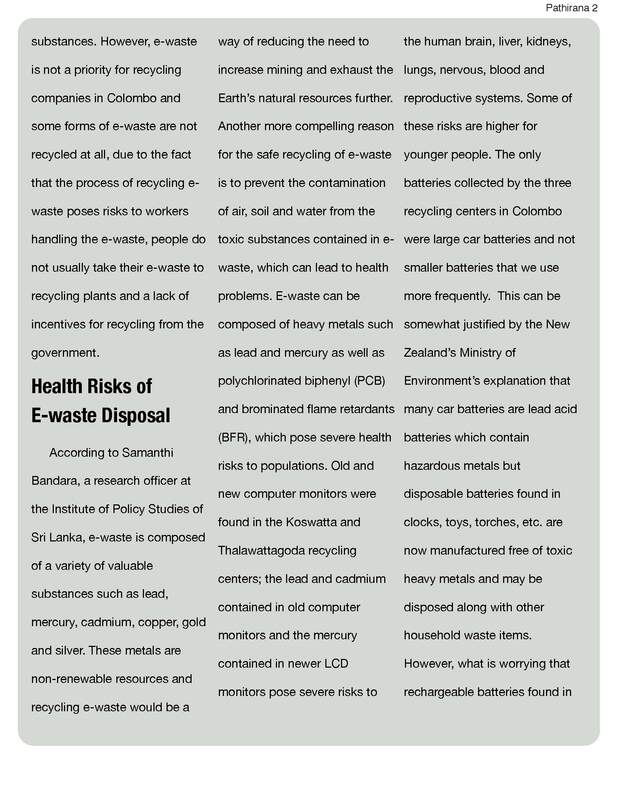 “E-waste: Turn pollution into prosperity.” The Sunday Times Sri Lanka, 31 Dec. 2017.Web. Accessed 21 Mar. 2018. 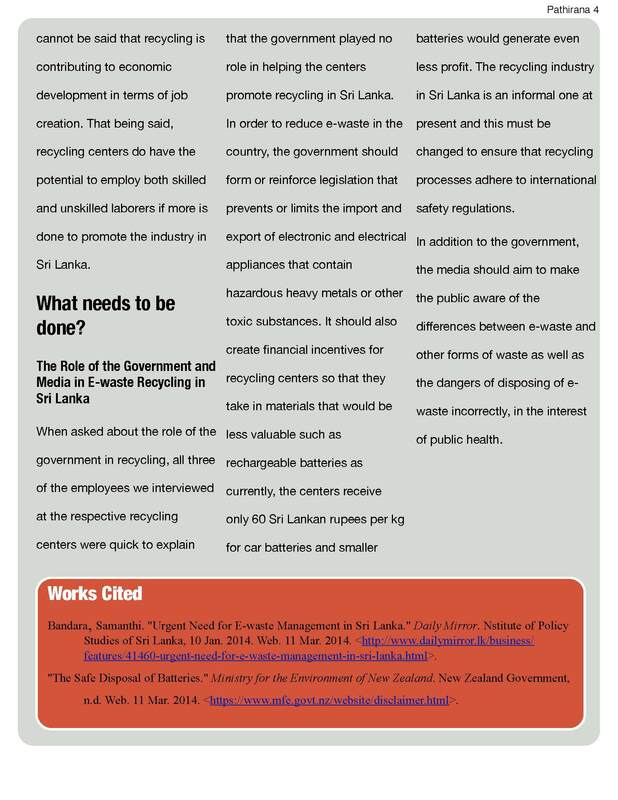 Forbes India on New E-Waste Guidelines.. a model for Sri Lanka? See the following link for this article….